Looking for kids vitamins? Here’s a great deal on SmartyPants Kids Complete Daily Gummy Vitamins! 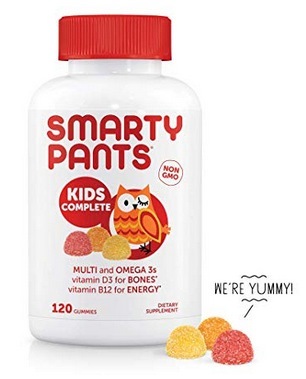 Amazon has these SmartyPants Kids Complete Daily Gummy Vitamins (120 count) for only $8.62 shipped when you clip the 15% off e-coupon, enter the promo code 25MARCHSPV3 at checkout and checkout through Subscribe & Save! This is a huge price drop and such a great deal on these vitamins! « Stacked Bohemian Bracelets only $8.99 shipped! I can’t seem to get that price. The clipped coupon and promo code will not both work. I was able to put in the code on the 2nd screen where you confirm the order. I was also not able to get that price….by clicking subscribe and save, clicking the coupon, and entering the promo code. Oh well. I still make out well at Vitacost during sales.